If you’re looking for a rugged workhorse of a knife, then the SOG Flash II is the best way to go. Not only is it affordable and dependable, but it also looks and feels great. This is perfect for anyone who needs a knife for work, protection or just general use. While this knife might be a little too long for people who just want something small, most people will love what this knife offers. 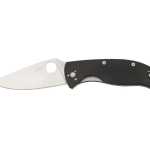 The SOG Flash II offers a 3.5-inch blade. Most versions of the Flash II have a partially serrated blade. The top is straight and the bottom is serrated. This gives you both edges whenever you need them. At the same time, some versions of this knife offer a straight blade without the serrated edge. 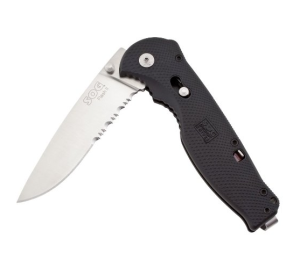 Buy an SOG Flash II on Amazon Now! Aside from being fairly long and multifunctional, it’s also very thick and rugged. It will stay sharp after cutting or sawing through nearly anything, and it’s easy to sharpen whenever it gets dull. Don’t be worried about sharpening the serrated edge. Not only does it last longer than the straight edge, which is common for most knives, but it’s easy to sharpen if it ever dulls. Just like with the blade, there are two different handles. The standard handle is made from glass-reinforced nylon. This type of handle is somewhat softer than the other one, and it’s also more comfortable when you’re cutting through something. At the same time, it isn’t quite as durable as the other handle. The second handle is made from machined aluminum. 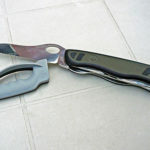 While it’s more durable and stronger than the nylon handle, it doesn’t feel as good and it might hurt your hand after some intense cutting. This comes down to personal preference, but both are great handles. The handle itself is 4.5 inches long, which should be long enough for a comfortable grip. It also has an ergonomic design that makes it easy to handle and use. You won’t have any problems holding it tightly or for long periods of time. 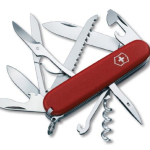 Anyone who buys a folding knife wants one that opens quickly and efficiently. The bad news is that automatic knives, or switchblades, are illegal because they open too quickly and can be dangerous. 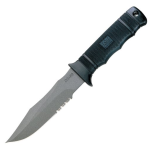 The good news is that the SOG Flash II is extremely close to a switchblade’s speed. All Flash knives come with SOG Assisted Technology. This is a powerful piston lock that you can easily release. You just have to release the safety, push the sliding button and the knife comes out. Not only that, but the lock keeps it securely in place until you’re ready to fold the knife. The safety is very easy to read. Just like with a gun’s safety, there will be a red color in the background whenever the safety is disengaged. This ensures that you’ll always know if the knife is safe or not. If you’re not used to knives that open quickly, then you might be a little wary of the Flash II. While it might seem dangerous, you’ll quickly get used to its opening speed. Just open and close it a few times to get a feel for the knife. This knife has a low, discreet clip that will securely fit your pocket whenever you’re carrying it around. The clip ensures that the knife won’t fall to the bottom of your pocket, and you can easily withdraw the knife whenever you need it. Unlike most knives that have bulky or noticeable clips, most people will just see a small piece of metal attached to the top of your pocket. The Flash II only weighs a little over three ounces, but it feels very durable and substantial in the hand. The weight is perfectly balanced, which makes it easier to use. If you want a knife that’s heavy enough to feel good, but not so heavy that it’s unwieldy, then this is perfect. The SOG Flash II offers a long list of features that everyone is sure to love. Not only does it open nearly as fast as a switchblade, but it also offers a sharp knife, good handle and reliable performance. If you want a good knife for general purposes, then this is definitely the one for you.